Sunday September 20th 1896 There was a heavy frost this morning. I went in to church alone, and over home with Mary Woolf to dinner. I stopped to see how Mother was and found her better. I got home early. Charlie had gone away for good and I helped Will get his new horses in the barn and we had a great time of it. We got the work done and went to bed early. Monday September 21st 1896 It was a beautiful forenoon but got cool and cloudy later in the day. I worked in the yard some and took up a carpet upstairs in the forenoon. After dinner I took up the dining room carpet and put down another. Leonard came today to begin work. Will went to town. Mrs Price and daughter called in the afternoon. 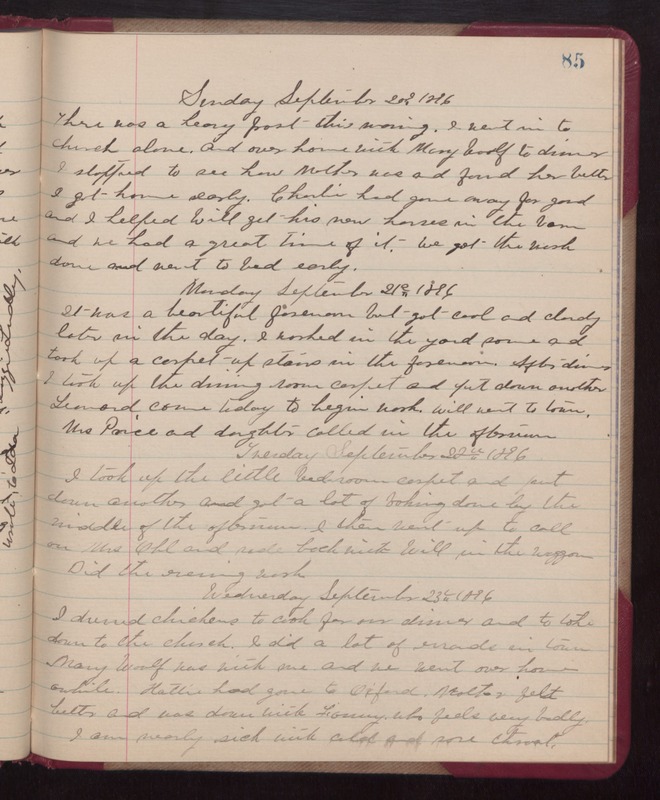 Tuesday September 22nd 1896 I took up the little bedroom carpet and put down another and got a lot of baking down by the middle of the afternoon. I then went up to call on Mrs Ohl and rode back with Will in the waggon. Did the evening work. Wednesday September 23rd 1896 I dressed chickens to cook for our dinner and to take down to the church. I did a lot of errands in town Mary Woolf was with me and we went over home awhile.Hattie had gone to Oxford. Mother felt better and was down with Fanny who feels very badly. I am nearly sick with cold and sore throat.